Professor G. W. Van presents his talent is this, frankly, remarkable group of photographs I was able to purchase recently. 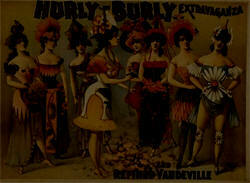 They are unusual not only for the content, which shows a pleasant afternoon full of hurly-burly, hootchie-cootchie and risqué behavior for the time, but also splendid examples of period dress, gentlemen when hats were virtually required (even for dusty fairgrounds) and a wonderful group of original painted sideshow banners. The same banners are shown elsewhere in a photograph dated 1915. I don't watermark items from my collection posted, but credit appropriately if you repost.